It’s not soap, it’s chocolate,” my apartment mate Steve explained. Despite his claim, the small paper-wrapped rectangular slab I held in my hand looked for all the world like a very old bar of hotel soap – it even had oily stains at the corners. Steve had just returned from a trip to Trenčin, Czechoslovakia (then, Slovakia now), and brought back samples of the local chocolate. Collecting foreign chocolate was a hobby of his, but he had extra bars (of course he did, who would dare eat one? ), so he gave it to me. I unwrapped the bar just to prove to myself that it contained a chocolate-like substance. I tasted a few crumbs, and, unconvinced that I wasn’t eating chocolate-colored soap, wrapped it up and put it on a shelf in my room. I’d probably still have the bar if the apartment hadn’t been broken into a few months later. Along with obvious stereo equipment and a TV, one of the things I noticed as missing was the chocolate. Our burglar was either hungry or dirty, both being equally unlikely. The cheap Czech chocolate (similar to P.J. O’Rourke’s “crumbling Commie concrete”) was the first in what has become a quarter of a century’s worth of strange food gifts from countries Steve has visited. I have dutifully kept all of them accessible on various kitchen shelves, but now have to make room for my ever-expanding collection of spices and chemicals. Rather than de-accession the collection, it will go into storage for future study. What follows is a catalog of The Belm Collection of Unusual Food, amassed from generous donations by Steve Strassmann. It is important to note that apart from three exceptions, none of the items in the collection have been opened and tasted. The first item, shown above, is a can of taro and sago dessert, which seems to be a variation on tapioca pearls. The can has a pull-tab top and a small spoon folded in half and tucked into the plastic lid. This early contribution to the collection predates the explosion of Asian markets in the Boston area, so at the time it qualified as unusual. 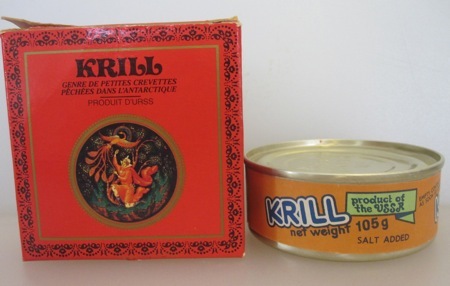 The next three items are classified as protein sources, the earliest of which is this package of krill from Russia. Despite the fancy packaging, the box contains a can of brine shrimp packed in brine. 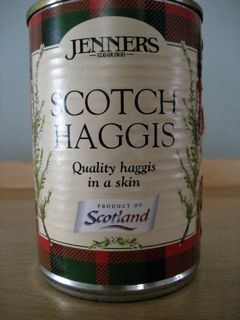 The next item, a can of haggis, has been documented previously on these pages, and therefore requires no further description. 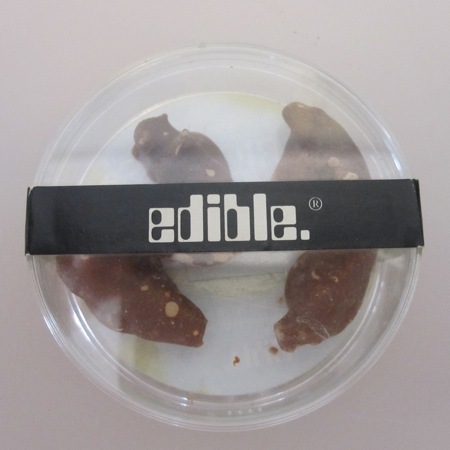 The last item in the proteins group is this container of chocolate-covered crickets, which the manufacturer takes great pains to advise us are edible. There is some discussion among the curators as to whether this item belongs with the proteins or candies. There was a fourth item in this grouping: a can of pork and chestnut stew retrieved from Paris. While it may have been the French equivalent of a can of Dinty Moore’s, it was unusual here for both the contents and the shape of the can, which bulged out at about a third of the height from the base. We assume the shape was meant to emulate a kettle or cooking pot, but bulging cans are also inextricably associated with botulism poisoning. Not so for Mr. Strssmann’s (now ex-) wife, who, when offered homemade pasta for diner, chose instead to open the can and consume its contents. That incident marked the beginning of the end for elle qui ne doit pas s’appeler. From proteins we move to condiments. 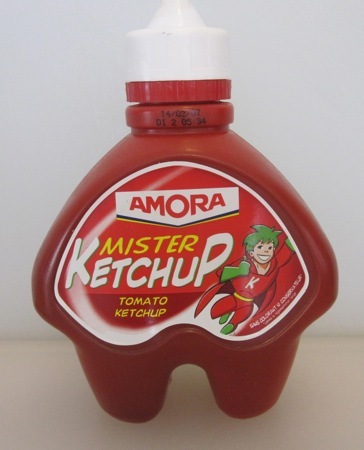 Europeans have a very different idea of what constitutes ketchup, to the extent that one of our consulting curators once sketched a study for a memorial to “the last bottle of good ketchup in Great Britain.” The first item, Mister Ketchup, is clearly marketed to appeal to children. The vaguely anthropomorphic bottle shape may suggest the human form, but it also suggests never being able to extract ketchup from the leg-like appendages. 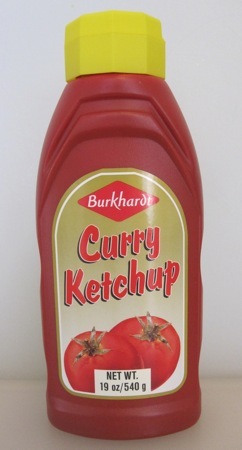 The second item is a bottle of curry ketchup from Germany. That taste combination is as American as french fries dipped in rich, creamy mayonnaise. From condiments we move to digestive aids. The first entry in this category is a bottle of “botanically brewed” dandelion and burdock beverage with ginger extract. We can only imagine how this concoction tastes; our best hypothesis places it in the Moxie/Vernor’s/Jaegermeister flavor space. 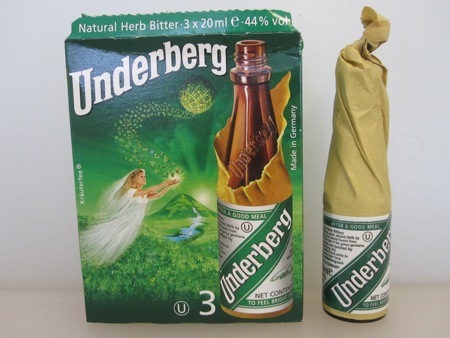 Similar in purpose and possibly in taste is this box of three bottles of Underberg natural herb bitters. The box was opened in order to highlight the trompe-l’œil technique used to illustrate the bottles. Unsurprisingly, given the collection’s origins, the last and largest category is candies and sweets. Although the first item, Every Burger, is commonly available in Asian markets, it is notable in that the tiny cookies made to emulate cheeseburgers predate the current trend for macarons. Unfortunately, only the box remains, the contents eaten by the curator’s son during the cataloging process. 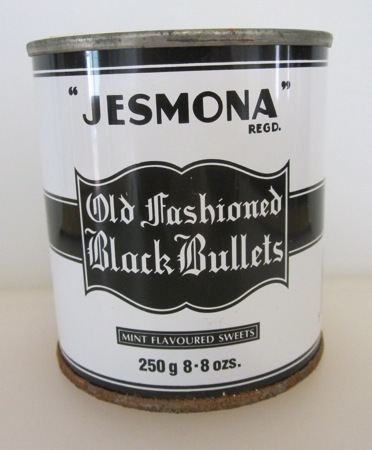 This can of black bullets has been opened only twice. The first time was in order to ascertain that the contents were spherical black mint-flavored hard candies and not contraband, the second time to assess the moisture damage that has caused the bottom of the can to rust. The second examination also revealed that the black coloring had aged to a medium brown and that the candies had fused together into a mass that can no longer be extracted from the container. The next item is from a world-renowned candy maker that has achieved international fame as the inventor of gummi bears. 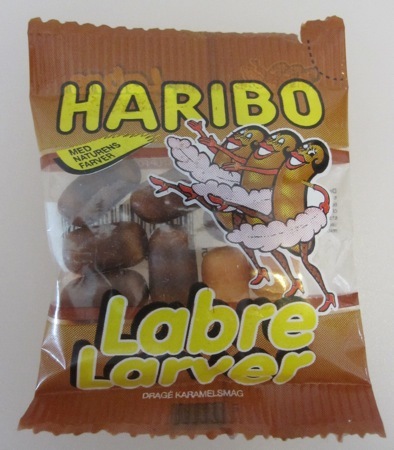 It has been suggested that the contents of this package of Lavae are similar to candy-covered licorice, but the misplaced marketing effort leaves open the possibility that this candy could be grouped with the previously described crickets. The last three items are grouped thematically by their method of content delivery: squeeze tubes. The first item in this group is a package of vanilla pudding, the collection’s second Parisian acquisition. This item is unique to the collection in that it is the only one stored in the refrigerator. 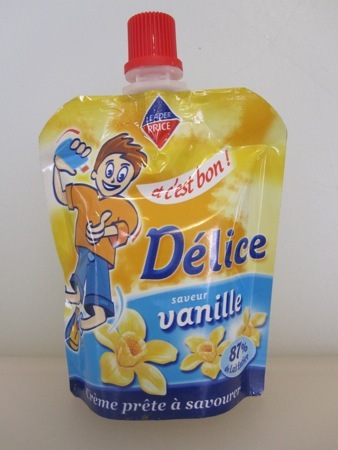 It seems unlikely that the child portrayed on the package is demonstrating the proper consumption technique. The penultimate item recalls the origins of the collection, in that it is another instance of chocolate from Slovakia. This tube of Pikao remains unopened, although we have been apprised that the chocolate paste is palatable and quite the rage with local children, who squeeze the contents of the tubes directly into their mouths. Our last item, while in tube form, is technically not food, but rather a food follow-up like the previously discussed digestive aids. 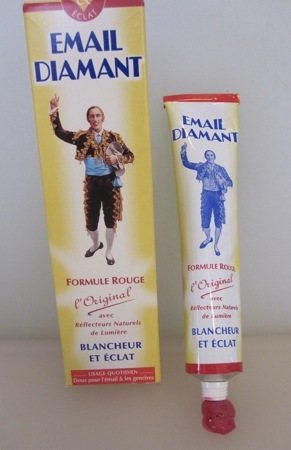 Email Diamant Formule Rouge, our most recent acquisition from Paris, is a popular brand of toothpaste that as been around since 1893. We opened this tube to confirm that formule rouge was in fact red in color. This formulation makes exceptional claims about its tooth-whitening abilities (email diamant translates as “diamond enamel”), but, after tasting the sample we extruded for photographic documentation, we have formed an alternate theory. It took repeated rinses with clear water to remove the pink color from our mouths, and assume that the act of brushing with this formulation is not unlike brushing-induced pyorrhea. The resulting pink-stained gums make the teeth look whiter by contrast. Other donors have attempted to contribute to the collection, but have failed to capture the essential strangeness that Mr. Strassmann understands so intuitively. His remarkable efforts in securing items for display and study are not unlike those of Bernard Berenson in securing the world’s great masterpieces for Isabella Stewart Gardner. His tireless work for the collection is to be commended; we hope to remain the beneficiaries of his taste for years to come. Has to be better than Yugoslavian “scotch” that I had at Noreascon 2 — apparently, it had picked up most of its flavor from the cap’s plastic liner. 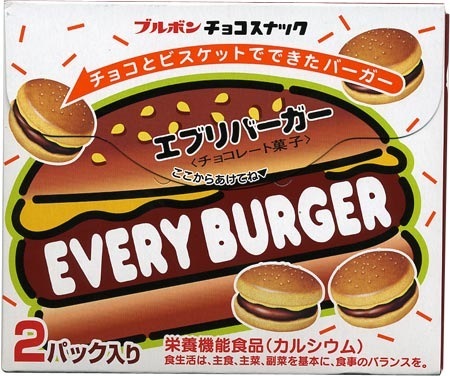 Also, you can purchase several of these (including Everyburger, a favorite of my younger son) at World Market. Definitely the one place to stop when you want weird food. While I haven’t tasted that particular variety, “dandelion and burdock” is a common variety of soft drink, widely beloved by the last couple of generations of children, and tastes much less peculiar than one would expect, and Fentimann’s soft drinks are generally marred only by their prices. Disclaimer: I am English. Is the stuff carbonated? I didn’t want to shake the bottle to find out. Is it like Tizer? Is Tizer still available in your area? It is indeed carbonated, usually relatively lightly. I haven’t, as I say, tried this particular one, or many others (not particularly my thing), and I haven’t drunk Tizer in a good many years, but my instinctive reaction would be “no”; really, nothing tastes like Tizer, other than possibly Irn Bru, which tastes a bit like Tizer would if it were made by people who were even less concerned with the eventual fates of their customers. I must confess I would have missed that Python reference without the link :). I’d be amazed if Tizer were not available when searched for, but it is not a major player. This speaks well of the development of the nation, frankly. Generally D&B tastes a bit like a rather more laid-back root beer; at least, that’s the best comparison I can think of. They’re not generally a taste explosion or in any way threatening. The inclusion of the ginger interests me, I’ll see if I can find a bottle and report back. You insult the national beverage of my ancestral people. Here in the US the dyes that produce the orange color are substituted with agents deemed safe by the FDA. Besides, there are many things when consumed in quantity that would kill a Scotsman before he died of Irn-Bru induced illness. Oh, believe me, I know. I’ve eaten and enjoyed most of them :). I actually quite like Irn Bru, very occasionally, but that doesn’t mean it’s not wrong. It is. I can talk to Höski about getting you a can of hákarl for the collection. That would be a welcome addition. I didn’t realize it was available in cans. Nope. I was commenting on the equal unlikelyhood of the burglar wanting wither a piece of really crap chocolate, or a bar of suspect soap. There should have been no reason for him to steal it.